Your team of intrepid adventurers has embarked on history's first time-travelling expedition, only for the Professor's Time Machine to malfunction, crashing into the lip of an active volcano and stranding you 100 million years in the past! Re-assemble your Time Machine without altering the past or causing paradoxes. 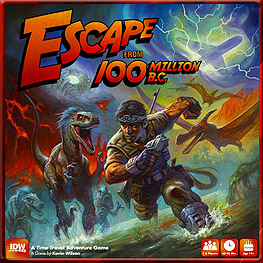 This co-operative, big box adventure game is designed by Kevin Wilson (Descent, Arkham Horror and TMNT) for 1-6 gamers. Explore volcanoes, jungles, and prehistoric swamps while searching for valuable technology and avoiding rampaging dinosaurs. Return wayward historical figures like Abraham Lincoln and Teddy Roosevelt, who've been pulled into the past by rippling time paradoxes, all while racing against a volcano that's about to explode and obliterate your entire team!